Starring: Kate Winslet, Jodie Foster, John C. Riley, and Christoph Waltz. The title Carnage seems like an appropriate title for any film by the international auteur Roman Polanski. Not that his films are particularly violent, though they have their occasional horrific moments, but the word “carnage” seems to apply to the psychological state of characters making it through Mr. Polanski’s unsettling worlds. When we think of Mr. Polanski as a filmmaker, we think of Jake Gittes staring blankly at a dead woman, Rosemary embracing her son of Satan, or a writer maliciously hit by a car, his life’s work flying into the air. So Carnage, shortened from the Yasmina Reza play God of Carnage, seems like an appropriate for Mr. Polanski to take on. Ms. Reza’s play was a hit in Paris, London, and here in New York on Broadway, and like Who’s Afraid of Virginia Woolf?, is a 4 person actor’s showcase more than anything else. But Carnage doubles the Georges and Marthas, who slowly break down social order into manic chaos seems ripe for Mr. Polanski to play with visually and build into another one of his cinematic satires. Which is where the problem lies for this adaptation: the director doesn’t even begin to bite the apple. Mr. Polanski has some eye for composition, but he never really takes the play and makes it his own. Part of the problem perhaps comes from that Mr. Polanski adapted the play with Ms. Reza herself, and besides a couple of bookended shots, the film keeps the narrative space of the play the same. Not that it should necessarily—Mr. Polanski has created some of the most terrifying small spaces in films like Repulsion and Knife in the Water. And thus we open in progress as Alan and Nancy at the Brooklyn home of Michael and Penelope. As we learn, Alan and Nancy’s son has smacked a couple of teeth out of Michael and Penelope’s son. We quickly pick up on their quirks, all of which are first seen as minor. 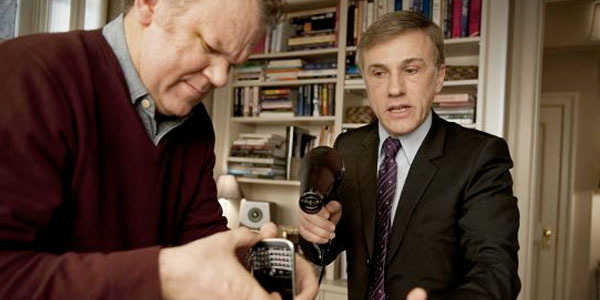 Alan (Christoph Waltz) is a somewhat absent lawyer who can’t avoid his Blackberry. Nancy (Kate Winslet) works in finance and seems to avoid any sort of conflict. Michael (John C Riley) sells hardware appliances and seems nonchalant about the issue. And Penelope (Jodie Foster) is working on a book about Darfur and sees herself as a righteous do-gooder. Similarly, the performances have not translated well to the film as well. You’d think since each of these actors are considered some of the finest of their generation, they would understand the difference between theater acting and film acting. In the theater, you can get away with letting it all go, as the feedback loop of the audience will build it and invest them more. Not in film, which requires subtlety and wit at every moment, with a careful precision of every line. Mr. Riley, Ms. Foster, and especially Ms. Winslet seem to believe an audience is sitting right in the room with them as they shout their lines at the top of their lungs, going for gestures and mannerisms much more suited for the proscenium. Only Mr. Waltz, with his playful accent and slow delivery of dialogue seems to know the score. When he has a big moment, he comes up close and almost whispers his lines, knowing that the camera will do the rest. But much of this is the essential issue with the text of Ms. Reza’s play. Carnage has no foreground, no context, and nothing to hold onto. It’s a game without rules and without stakes, and while Ms. Reza can create some humorous moments, her play is essentially shallow, mocking bourgeois life because why the heck not? George and Martha could never carry a play by themselves; Albee knew they needed an audience for their quibbles. And perhaps that’s why God of Carnage worked on stage—an audience could push them to their boundaries, where the audience is constantly implicated along with the actors. With film, that strip of light creates an immediate separation, where we are free to observe without being observed. That it unless you use film as it was designed, and how Mr. Polanski has done so well in the past while driving characters insane in closed spaces. Mr. Reza has no interest, so neither should we.